L-alpha glycerylphosphorylcholine, more commonly known as choline alphoscerate or simply alpha-GPC, is a natural precursor of acetylcholine, a neurotransmitter that is crucial to healthy memory and learning. Its chemical structure allows it to also be incorporated into cell membrane phospholipids, improving membrane fluidity and potentially helping to reverse age-related changes in nerves. 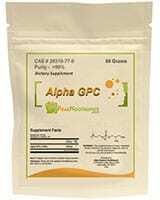 Alpha-GPC is present in small amounts in meat and dairy, but most alpha-GPC is produced synthetically from egg or soy lecithin and incorporated into common foods or used in supplements. It has long been known that choline is necessary for normal neurological function, but not all choline supplements are created equal. Of the many choline supplements on the market, only three reach the brain in significant concentrations: alpha-GPC, centrophenoxine and CDP-choline. All offer similar benefits; however, studies have consistently shown greater beneficial effects with alpha-GPC than with CDP-choline. This is thought to be in large part due to the presence of the glycerophosphate group (lacking in both centrophenoxine and CDP-choline), which is crucial for its incorporation into neural cell membranes. >> Looking to Buy Alpha GPC? Click here to see our recommended sellers. While we know that alpha-GPC is an excellent source of choline, it is only more recently that we have started to recognise it for the remarkable pharmacological effects it displays at higher doses. 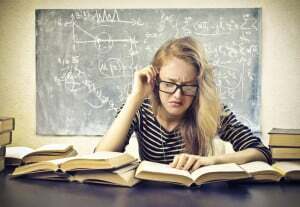 While athletes may use alpha-GPC for its enhancement of growth hormone production and power output, the main use of alpha-GPC in healthy individuals is for improving memory, thinking skills, and learning. While studies of the use of alpha-GPC in healthy human subjects remains limited, in rats it has been shown that daily injections of alpha-GPC over 21 days resulted in improved learning outcomes 2 hours after dosing. And no wonder! 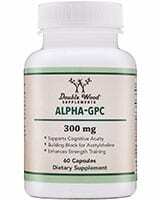 As we continue to investigate the effects of alpha-GPC on the brain, we are uncovering a myriad of beneficial effects. 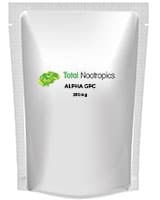 Studies suggest that alpha-GPC can increase acetylcholine levels as well as expression of acetylcholine transporters in the brain, particularly in the area associated with memory formation. This may be partly because while choline tends to be present in relatively low levels in the brain, alpha-GPC can reach much higher concentrations. Increases in several other neurotransmitters have also been observed with administration of alpha-GPC, including serotonin, dopamine and GABA. Finally, though it is not documented in humans at this stage, in rats alpha-GPC appears to activate protein kinase C, an intracellular protein involved with memory formation. 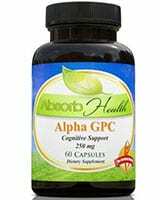 As researchers continue to investigate the effects of alpha-GPC, it is becoming evident that this amazing supplement can also provide excellent therapeutic benefits for patients with deteriorating brain function. Alpha-GPC shows significant promise for treatment of Alzheimer’s disease. Patients with Alzheimer’s are known to have upregulated choline metabolism, meaning that they have higher requirements for dietary choline. If these needs are not met, cell membrane damage can result. It is unknown whether alpha-GPC directly prevents or reverses this damage, but it does appear to significantly improve thinking skills in Alzheimer’s patients. When patients were given alpha-GPC at doses of 1,200 mg per day over periods of 3 to 6 months, researchers saw improvements in five different parameters that assess cognitive function. Similarly, improved cognitive recovery was observed in stroke patients treated with alpha-GPC at 1,000–1,200 mg per day for 6 months. A 2001 review compiled the results of thirteen published clinical trials that included a total of over 4000 patients, and concluded that alpha-GPC is an effective treatment for cognitive dysfunction of degenerative, vascular or combined origin. All studies demonstrated significantly improved cognitive function with treatment, particularly in terms of attention, memory and mood. The study noted that these therapeutic benefits are unique to alpha-GPC – the same effects have not been observed with choline or lecithin supplementation. 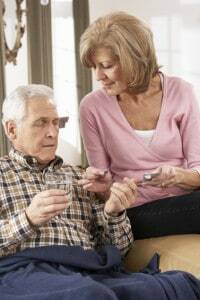 While alpha-GPC is available as a prescription medication for Alzheimer’s disease in Europe, in most countries it is sold as an over-the-counter supplement and information as to exact dosing requirements is limited. Most labels suggest 300–600 mg per day, but this is drawn from a study that investigated its effect on power output and increased growth hormone secretion and is therefore most applicable to those wishing to use it to enhance athletic performance. 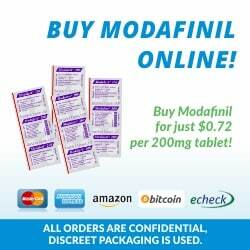 For nootropic effects, it may be more appropriate to use it at the dose of 1,200 mg as used in most studies examining the effects of alpha-GPC for cognitive enhancement. Further research is still needed to determine exactly what cognitive benefits are conferred by alpha-GPC in healthy people, and what dose is appropriate for improvement in memory and learning. Alpha-GPC is generally considered safe for healthy individuals but if you have a medical condition or are taking any other medications, you should consult a pharmacist or doctor before using it. Observed side effects have included heartburn, headache, insomnia, dizziness, skin rash, cognitive stimulation and confusion. However, these side effects are rare and the risk can be minimised by starting with a low dose and gradually building up if necessary. Research on the use of alpha-GPC during pregnancy or breastfeeding is limited, so it is best to avoid using it in these situations. Because alpha-GPC increases the concentration of acetylcholine in the brain, it can attenuate the effects of anticholinergic medications such as scopolamine. On the other hand, it has actually been shown to enhance the effect of rivastigmine, an acetylcholinesterase inhibitor (a drug that reduces reuptake of acetylcholine, thereby increasing its concentration). Preliminary research supports the pairing of alpha-GPC with acetylcholinesterase inhibitors for more effective treatment of Alzheimer’s. Alpha-GPC absorbs water very easily and should be stored in a cool, dry place. Large quantities should ideally be vacuum-sealed and stored in the freezer. Originally posted on February 26, 2015, last updated on December 6, 2018. Unreadable on an iPad. Silly icons on the left block text.